No mechanics of materials book can possibly show you how to analyze every type of problem you may come across. Most mechanics of materials textbooks focus on complex derivations and variables that result in several relatively simple formulas without providing a whole lot of explanation along the way. 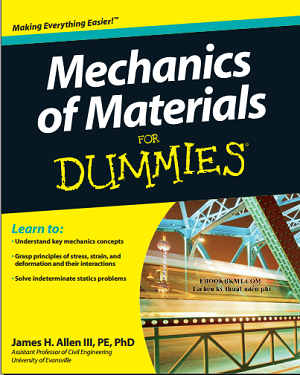 Mechanics of Materials For Dummiesgives you the basic rundown of the theory but focuses more on why you need to know the formulas and how to apply them rather than where exactly they came from. I intend this book to serve more as an application-oriented text that utilizes the basic theories.